The question for me, is how they even dated other pOxy scarps 2nd or 3rd century? What is it in the debris they were found with that gives them a pre-4th century date? It seems as if the dating of these is separate from the archeology of the sites, done in London after black market pieces are bought. This is not the way good archeology is done. More on P. Oxy. 5345, a papyrus formerly known as the "First-Century Mark Fragment." As you may know by now, this papyrus fragment was initially dated by Dirk Obbink to the first century CE. However, in the recent edition published by Obbink together with Daniela Colomo, the fragment is tentatively dated to the late second or early third century, that is, more than one hundred years later. and damaged and the scribe inconsistent." Nevertheless, Obbink and Colomo associate the fragment with a group of hands called by Eric G. Turner "Formal Mixed" (because it alternates wide and narrow letters), which is traditionally dated to late second and third centuries. However, the paleographical association made by the editors is not entirely convincing to me, at least judging from the examples they quote: P. Oxy. XIII 1622 (Thucydides), Papyrus 103 (Matthew), and Papyrus 38 (Acts). It is not only that the script does not look similar enough to me, but from the three examples they quote only the Thucydides papyrus can be securely dated to the first half of the second century (the verso of the manuscript was reused in order to accommodate a documentary text dated 148 CE). In a post that my friend, Brent Nongbri, wrote on his blog yesterday, he singled out P. Oxy. III 412 (Julius Africanus, Kestoi) as being a bit similar to the new fragment of the Gospel of Mark. If Brent is correct, this might push the date of the Mark fragment forward into the third century since P. Oxy. II 412 "is datable to some point between 227 and about 276 CE." Let's hope that better images of the Mark fragment will soon be published. Until then, perhaps we should refrain from doing appraisals for sensationalist purposes. https://brentnongbri.com/2018/05/24/so- ... y-numbers/ Pretty explosive stuff. 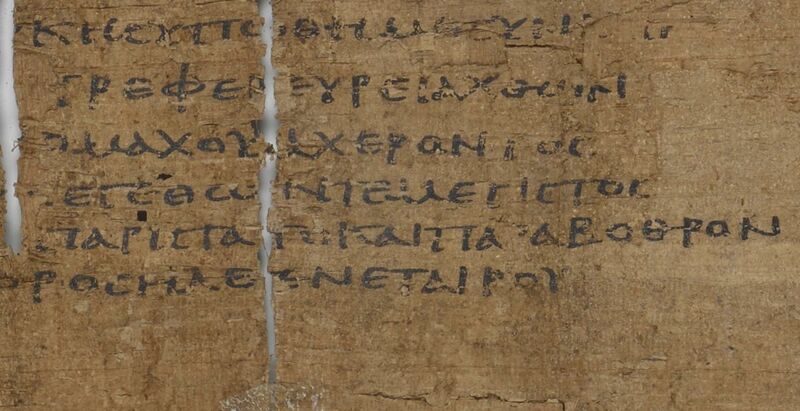 The attempted sale of an Oxyrhynchus papyrus by an Oxford professor would certainly be…irregular, to say the least (UPDATE: EES denies attempted sale; see bottom of post). If this commenter is actually Scott Carroll, and if these allegations prove true, this would be quite scandalous. The 'first century' claims weren't the result of an 'apologetic' agenda but perhaps the only the consequence of a pre-existent agenda - i.e. profit was the real motive. The infamous First-Century Mark Fragment has finally been published in the latest volume of the Oxyrhynchus Papyri as P.Oxy. 5345 (vol. 83 ) (so that's the source of the fragment and, apparently, there are no provenance issues involved). However, according to the description provided in the volume, the fragment is not from the first century CE (no wonder! ), but rather from the second or even from the third. This dating rectification reminds me of a Radio Yerevan joke. Question: Is it true that Ivan Ivanonich won a car in a lottery? Answer: In principle, yes, but it was not a car but a bicycle and he did not win it but it was stolen from him. IMHO, a very early first century claim would hurt the apologetic agenda. According to the apologetic agenda oral traditions preceded anything that became written. Not to say that perhaps such a document did exist in the latter first century but what would be the chances of finding the original document? The morely likely scenario is that any writings found are copies of copies which date to the second/third century.